Oh boy, it's finally here. Arrow's brand new, limited Scarlet Box collection of Clive Barker's Hellraiser. It's a whopping 4-disc blu-ray set, including loaded special editions of the original, the first two sequels, and Barker's early short films. It's kind of an update to Anchor Bay's already impressive, Lament Configuration limited edition 4-disc DVD set, but with all new scans, HD transfers, and a heap of new extras. The 2009 US blu-ray of Hellraiser still has some unique special features, so we'll look at that, too, as well the old 2000 special edition DVD. Because I want to do a thorough review worthy of this thorough set. Update 9/8/17: Adding another Hellraiser 2 DVD to the mix. Why bother? Well, one, just because the more completist I can be the better. But the bigger reason is because the Anchor Bay 20th Anniversary Edition has some exclusive Red Shirt extras on it, that aren't included in the Scarlet Box. It's also worth noting that Arrow eventually reissued the Scarlet Box here in the USA since the last update, in December of 2016. Update 2/19/16: I've added the US Paramount DVD of Hellraiser 3 into the comparison mix (it's got a pretty unique doc covered in the special features portion), and also consolidated this and the previous update to make it all a more readable, cohesive piece. Update 12/5/15: I added the old US Anchor Bay Hellraiser 2 DVD into the comparison mix, and added the section on Arrow's Hellraiser 3 mis-framing. 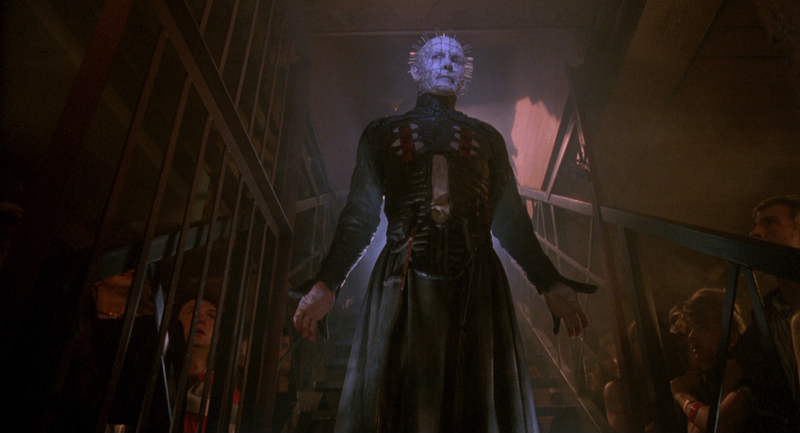 If you've never seen Hellraiser fan... then you mustn't be a horror fan. But even then, I would recommend this film, because it's truly unique, intelligent and engrossing. And gross. But really, there's so much more to this story; you've got to see past that. It's Barker's masterpiece: a wild story that addresses the darker side of sexuality and invents a Hell that, in a very twisted way, can be attractive. 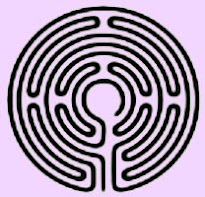 It's the story of what a family must endure when one man decides to unlock the gateway to Hell, and then return. 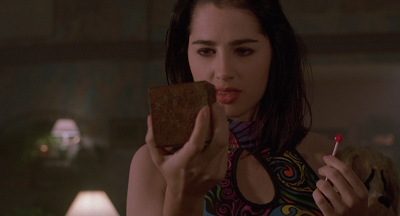 It's got strong performances, great visual effects, an epic score, and while the film may be a little rough around the edges thanks to a low budget and first time director, all its minor flaws are swept over by Hellraiser's visionary content. 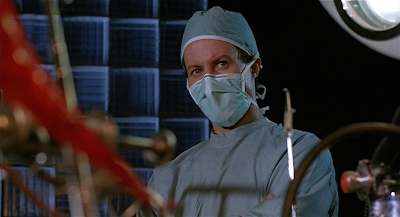 Hellraiser II: Hellbound suffers from pretty much all the usual drawbacks of sequels, the worst of which being that it's no longer adapting a Barker novel, instead penned by screenwriter Peter Atkins. Still, it's the most crowd-pleasing of the eight (as of this writing) sequels, bringing back pretty much the entire cast and bringing them into a much more ambitious, and higher budgeted, world. 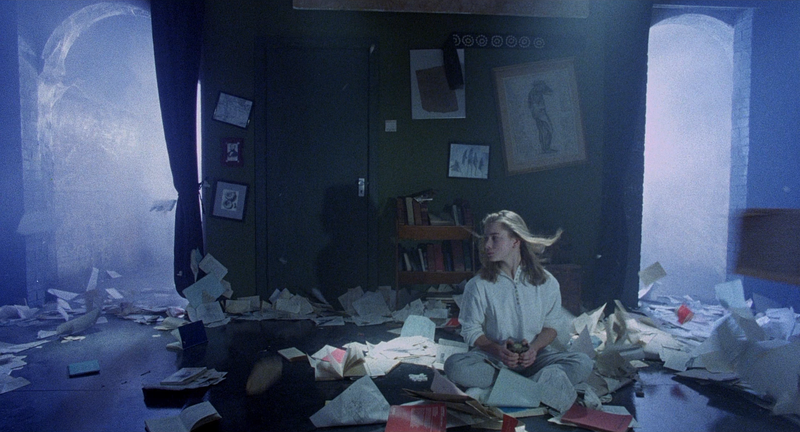 There are stunning visuals and more of pretty much everything fans wanted to see return from the original. It's a great time and very fun film, but it's it's just not quite as smart, and is missing the focus of the original film. Why are we here except to see more? That's more than enough reason to watch and have fun; but we've slid down the scale of artistic achievement. 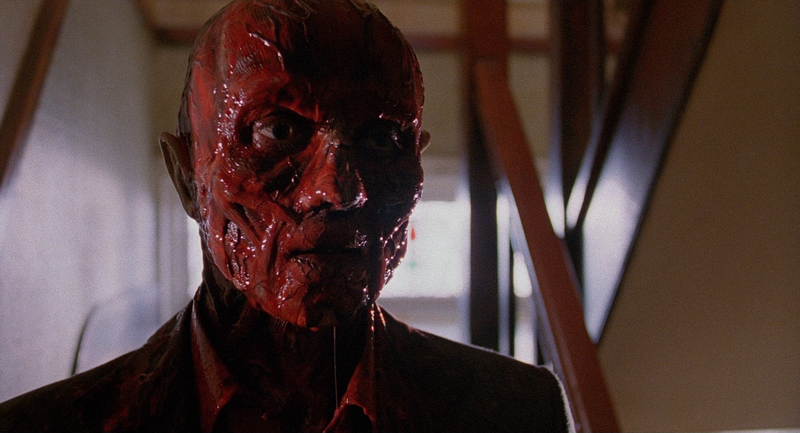 So Hellraiser II slid, and then Hellraiser III: Hell On Earth, embraced that direction and ran headlong into it. Hellraiser 3 is a B-movie and is fine with that. It's again written by Atkins; but this time it's directed by Amthony Hickox (Waxwork, Sundown: the Vampire In Retreat), who just takes the opportunity to play with all of Hellraiser's toys. It's villains and iconography are back, but now in almost a silly world with lighter characters. There are still hints of Hellraiser's dark power; but this is a film where a monster kills people by shooting compact discs out of his head. This one still looks to have a nice budget (something later films in the series sorely lacked), and I'm sure if this wasn't titled "Hellraiser III," horror lovers would still be talking about what a kick this movie was. However fans looking for the greatness of the original Hellraiser were further disappointed... even maybe a little insulted this time. 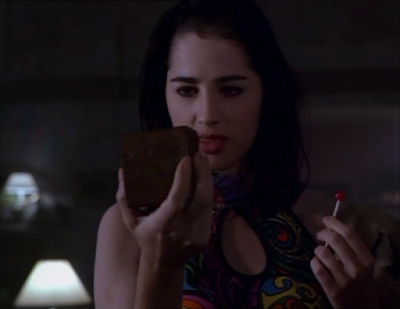 But if you can ease off your expectations of another Hellraiser 1; this is a very fun and engaging 90 minutes. But we're definitely at the point where I wouldn't recommend it to the non-horror fans. 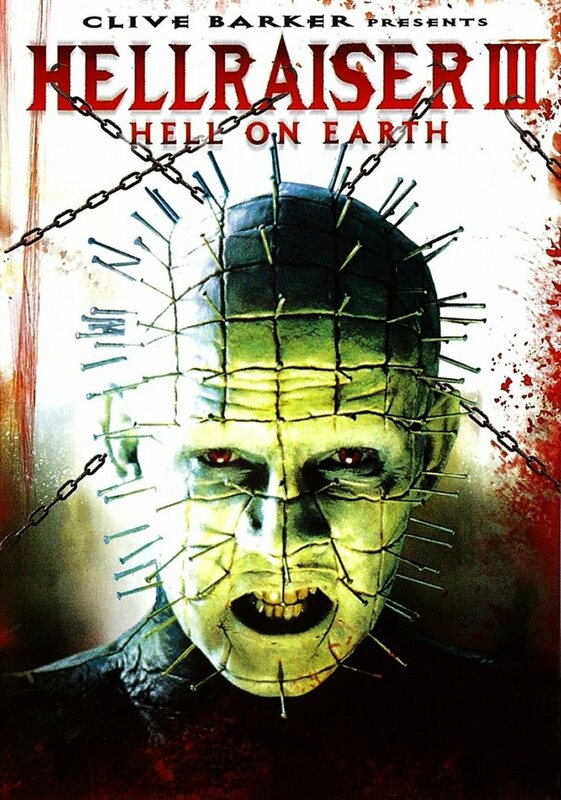 Now the Hellraiser films have been released and re-released on home video plenty of times. We're only seeing the first three in this set, because the later ones are all owned by Dimension Films. But the films get less and less worthwhile as you go; so the first three are more than fine. 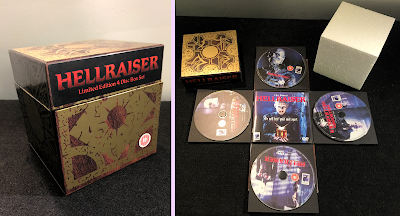 Hellraiser was first released on DVD in 1997, and then re-released in a cool, limited edition tin as a bit of a special edition with Hellraiser 2 in 2000. Unfortunately, I sold that off long ago, but I did manage to snag a single disc release of the 2000 DVD for this comparison. Then we've got the aforementioned UK DVD boxed set of the first three films from 2004, which is kind of the standard def predecessor of the Scarlet Box. It's worth noting that both sets include two versions apiece of Hellraiser III, so we'll get into that as well. Then, to bring in the HD competition, we've got the 2009 US blu-ray, which is also from Anchor Bay. And we're comparing them all to the brand new, just released in November 2015 Scarlet Box set from Arrow. All four discs slightly letterbox their anamorphic 16x9 images to 1.85:1 (excluding the fullscreen transfer, obviously). The DVDs both have slightly less info on the sides, at 1.84:1, but it's the definition of negligible. Still, it's nice to get that extra sliver if you've sprung for the blus. Clarity is definitely up on the blus, especially Arrow's. Even Anchor Bay's is a nice step up from the DVDs in sharpness and resolution, though. 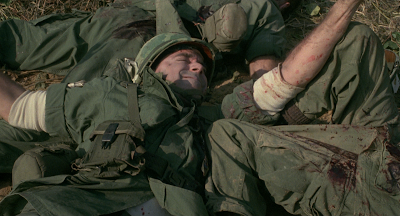 Both blus also have more natural colors, though their color palettes are different, too (compare Julia's blouse... redder on the DVDs, bluer on the US blu and yellower on the UK). The first thing that draws your eye between all of them, though, is probably how much brighter Arrow's disc is. It really brings out some details that were crushed in past releases. It doesn't stop the film from being dark when it means to me, it just keeps the film from being murky like the older DVDs look. Preferable degrees of brightness and sharpness can be a little subjective... a number of people online have been voicing their displeasure in how the clearer transfer makes Arrow's blu look especially grainy. But the film itself (lower budget and low lit) is just grainy, and a blu-rays job is to display a film as clearly and faithfully as possible; which is what Arrow's disc does best. You'll also notice Anchor Bay's 2000 DVD included a fullscreen option. It's mostly a "chop the sides off" affair, but it does have some additional vertical information. But it's really just a product of the "people hate black bars" times, and you can see why none of the subsequent releases bothered to carry it over into more modern times. I've also got a pair of Hellraiser II Anchor Bay DVDs on hand: the old 2001 disc and 2008's 20th Anniversary Edition. Not that I expect them to add anything surprising to the comparisons, but the 2001 DVD offers a fullscreen mode just like the first film did, so I thought it might be worth looking at to see how the 4:3 version looks. And the 2008 has a few exclusive special features. Hellraiser II doesn't look quite so grainy, again down to how the original film looks, as Arrow's new blu is another fresh 2k scan from the film's original interpositive (true of all three films in the set). Framing is slightly letterboxed to 1.85 again, with a little extra picture along the bottom on the blu-ray as opposed to the DVD, which is again more of a 1.84:1. 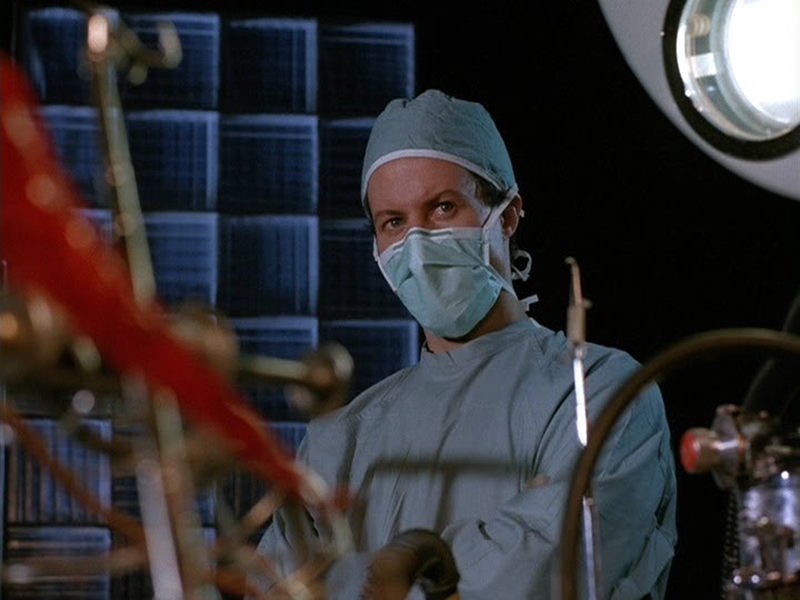 Detail and clarity are naturally improved in this film's jump to HD, but you might notice another difference with the UK DVD: a ghosting effect on the doctor's hand. Yes, all of the DVDs in the 2004 boxed set are interlaced - yuck. Even the original 2001 DVD didn't have this problem, and happily they got rid of it again for the 2008 edition; so I presume Anchor Bay just used US NTSC transfer their UK PAL set and let the interlacing ride. Naturally, Arrow's blu-rays are free of this issue. And again, the full-frame version is open matte, giving us plenty more picture on the top and bottom while losing nothing on the sides. Of course, it's mostly dead space and looks far less attractive than the widescreen image. 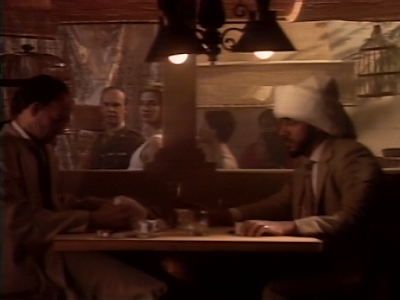 Now we come to Hellraiser 3. 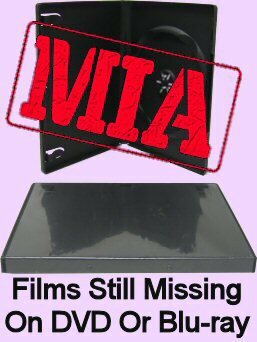 Between the Arrow and Anchor Bay sets, there was also an interesting US DVD from Paramount in 2006. It's unfortunately just the R-rated cut, but it looks pretty good and has a unique special feature which makes it interesting. So, like I said, both sets have two different versions of Hellraiser 3 in them. But they're different different versions. Anchor Bay gave you the unrated version of the film in both widescreen (the film's OAR) and fullscreen. 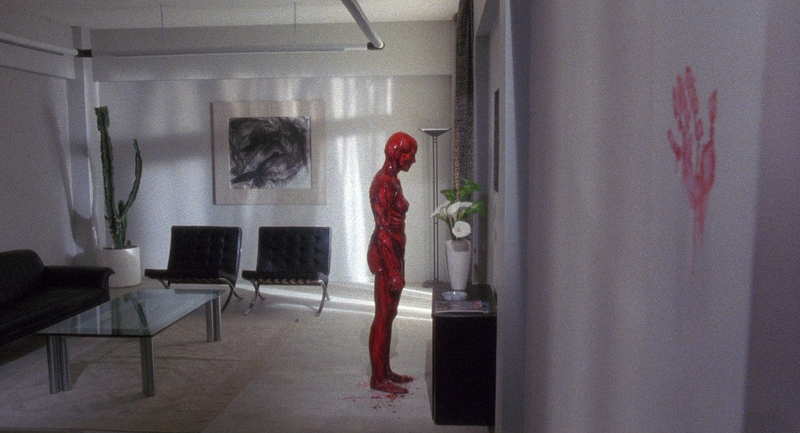 Arrow gives you the edited theatrical cut and the complete unrated version, both in widescreen. So that's one unique thing the AB set has going for it: the fullscreen version, though I'm not sure how desirable it is. Of course, the same could be said for Arrow's theatrical cut. Paramount, meanwhile, just offers the widescreen R-rated cut. 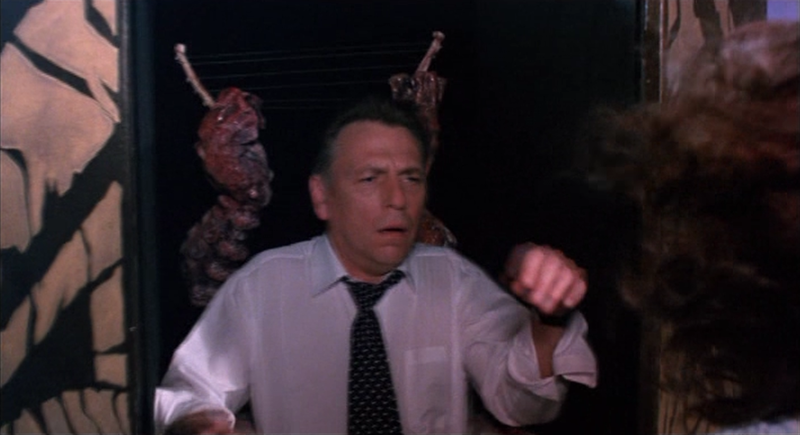 Thankfully, Anchor Bay's DVD isn't interlaced for part 3. And they're clearly using the same master, making the US and widescreen UK DVDs almost entirely indistinguishable apart from AB's PAL speed up. That's way too much on the left; you can see where the special effect of the pillar ends and it's just big wooden boards. Clearly that was not meant to be seen on camera. However, that shot passes very quickly, and most of the film, while still showing you more picture on the left hand side than intended, doesn't contain anything that clearly doesn't belong. It's mostly just a little bit extra of the set. But every once in a while, a shot will pop up with something you shouldn't see in it. Anyway, except for the unrated insert footage, the two Arrow transfers look identical to each other, and are natural HD improvements over the old DVD. The old fullscreen version, which has extra vertical info thanks to its open matte, looks softer and murkier even than the widescreen DVD version. Really, I can only see it having mild curiosity value for serious completists, so I sure don't mind its absence from the Scarlet Box. 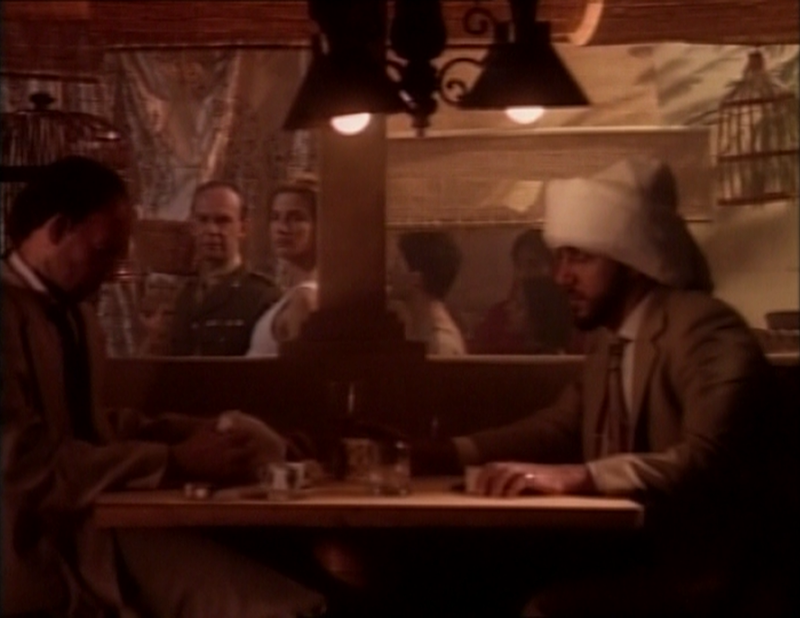 It's also important to note that AB's widescreen DVD is framed at about 1.76:1, as opposed to Arrow's 1.85. So the new blu has gained a decent bit of additional picture along the sides. There's only three shots in this next set of Hellraiser 3 screenshots because it's one of the scenes only shown in the full, unrated version of the film. So it isn't in Arrow's theatrical cut. You'll notice the quality is poor in all of these versions, because neither Anchor Bay nor Arrow could find proper film elements for the unrated footage, so they used, apparently, an old laserdisc or tape for this footage. The other thing you'll notice is that two of the shots are fullscreen this time (1.30 on Anchor Bay's, and 1.33 on Arrow's). That's because, as you can see in the top shot, Anchor Bay just cropped the unrated footage to 1.76 to match the rest of the widescreen film. The footage both labels are using is fullscreen, missing picture on the side. So AB's cropping is on top of that, meaning it's cropped on all four sides(!). That's probably why Anchor Bay felt it was worth including a fullscreen cut of the film, so they could give you that film without their cropping. Arrow, on the other hand, takes the unusual tact of shifting the aspect ratio mid-picture on their unrated version. 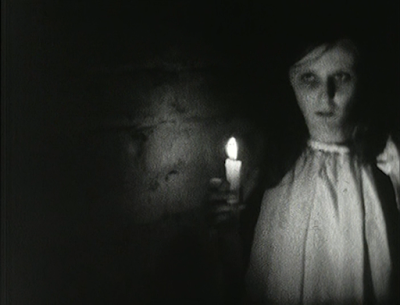 Rather than cropping the already cropped footage like Anchor Bay, the picture jumps from 1.85 to 1.33, which is a little distracting to say the least. And that is presumably why they also offer the cut theatrical version (because why else would anybody want an identical version of the film except cut?) - so you can see their HD 2k scan without the sudden drop in quality and shift in aspect ratio. I guess that's fine if you want to show off how good Hellraiser 3 looks here; but this film is really much more enjoyable in its uncut form. So it's a bit of a damned if you do, damned if you don't situation. Would it be better to have double-cropped the footage to make it all 1.85, or shift the aspect ratios like they've done here? They made a call, and neither one was going to please everybody perfectly. The only disappointment of this box is that they don't have proper film elements for the unrated footage, but what can you do? Apparently it's lost to the ages; they tried. And they still gave us the best we can get. 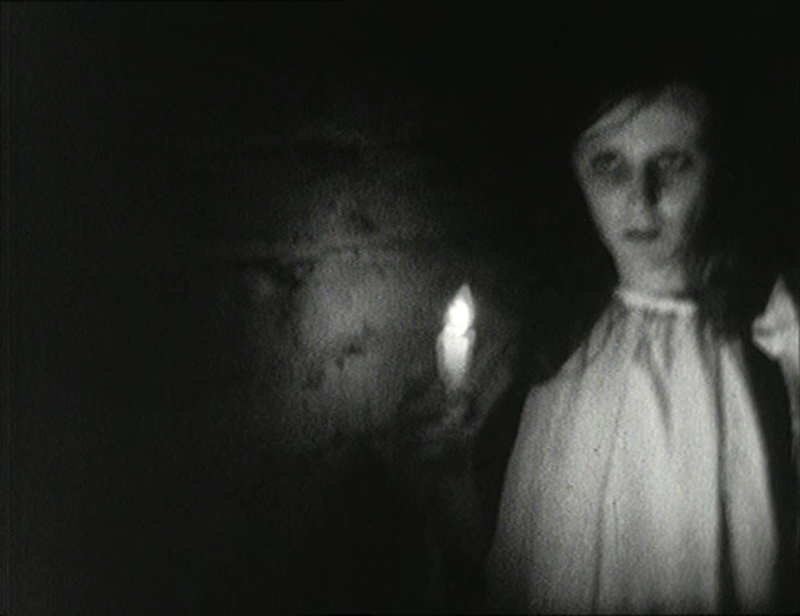 Both sets also include Barker's two early short films, Salomé and The Forbidden, and the quality of the original films is so raw, it's hard to distinguish a big difference between them (especially Salomé). Arrow's book doesn't even mention how they made the transfers for these like it does with their Hellraiser restorations, because I doubt they did much. They're both fullscreen, which is their OAR. One substantial improvement, however, is that Arrow's set corrects the interlacing problem on the Anchor Bay set; so it is, once again, a worthwhile improvement. All the films have great, lossless 2.0 audio tracks and optional subtitles in the new box. The first two Hellraisers also have 5.1 mixes. On the US blu, Hellraiser only has the 5.1 option. All of the discs, including the US and UK DVDs, have optional English subtitles as well. audio commentary with Clive Barker - this is a second, newer commentary with Barker by himself, providing a lot of info he missed the first time around. on-set interview with Clive Barker - a short, vintage promo interview. Trailers, TV spots, and galleries - the original DVD had a trailer and some stills, but this set adds more. 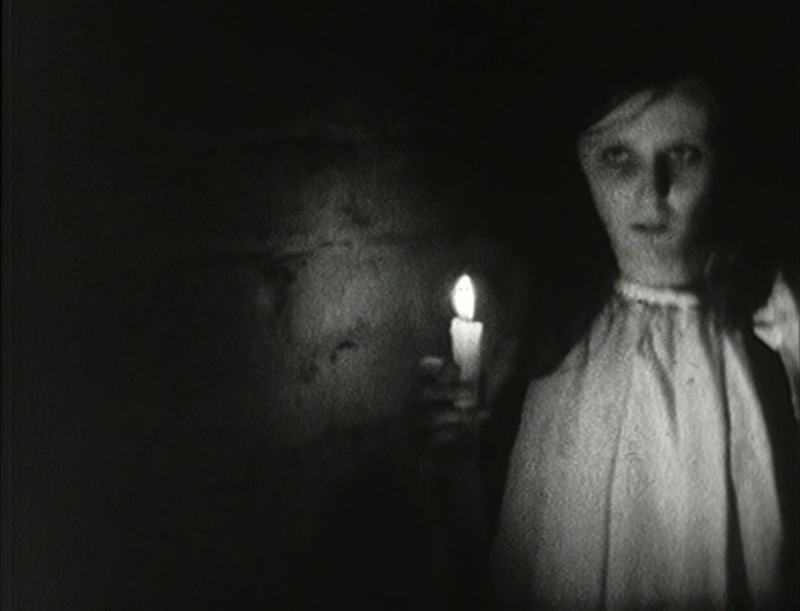 The fourth disc, with Barker's short films, also included interviews with Barker and some of the cast as part of each feature. The US blu-ray of the first Hellraiser has the original 2000 extras, but not any of the 2004 extras except for the Doug Bradley Under the Skin interview. So it's missing the second commentary and the vintage interview. BUT, and this is a big but, it does have some new, exclusive extras. Specifically, it has three all new interview featurettes by Red Shirt Films, who always do a great job. They're all around 15-20 minutes and specifically, they interview Ashley Lawrence, composer Christoper Young and actor Andrew Robinson. And Anchor Bay's 20th Anniversary DVD also has three all new interview featurettes by Red Shirt Films, which again are all around 15-20 minutes each. This is in edition to the commentary and all the other stuff carried over from the 2004 UK box, even the easter egg behind-the-scenes footage. But today, it's just these Red Shirt extras that are still of interest, because they never made it over to the Scarlet Box. The first one interviews cenobite actors Simon Bamford, Nicholas Vince and Barbie Wilde, the second one is with director Tony Randel, and the third is Dr. Channard himself, Kenneth Cranham. 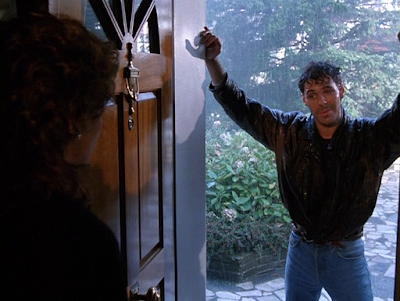 And I mentioned earlier that Paramount's US DVD of Hellraiser 3 had an interesting exclusive feature, right? It doesn't have any of the extras from the other releases, except for the theatrical trailer, but it has a half hour documentary called Clive Barker: The Art of Horror. This had previously been released on VHS in 1992 by itself. It's not about Hellraiser 3, but Clive in general. It centers heavily around a couple direct interviews with Barker, and focuses on some interesting aspects of his career you don't see covered as often on his DVDs including his model kits and comic books. He even talks about Transmutations and Rawhead Rex, which is valuable, since there are no editions of those films with any extras at all. If you've got this disc, hang onto it, and you might even want to pick it up as an addendum to the Scarlet Box just for this feature. If you do, be careful, Miramax reissued this Hellraiser 3 DVD in 2011, but minus the doc. So make sure you get the 2006 one. The front covers are identical, except Miramax's has their logo on the top. Soundtrack Hell - a featurette interviewing Stephen Thrower, of a band called Coil. He talks about how he was commissioned to create a soundtrack for Hellraiser that ultimately wasn't used, in favor of what Chris Young created. Leviathan - Just like on disc 1, but all about Hellraiser 2. This was sold with the first one on DVD, too; and I think this one is also cut down, although the version here is over two hours. deleted surgeon scene - This might actually be the crown jewel of Arrow's new extras! 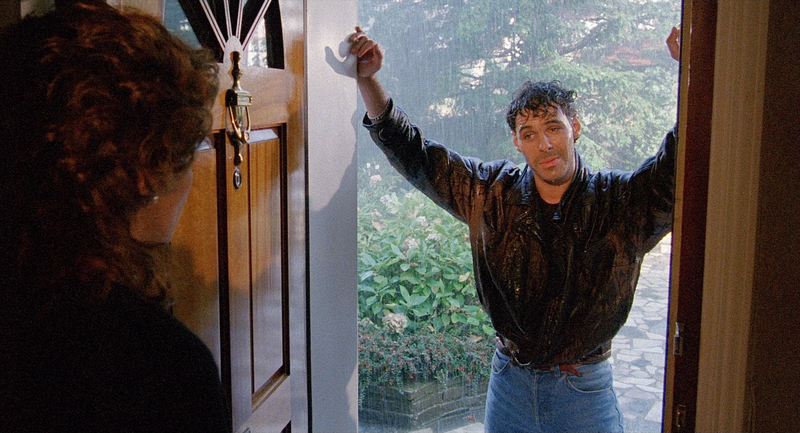 This is a very famous scene that was long believed to not actually exist. You see, on the back of the old Hellraiser 2 VHS box, one of the screenshots showed two cenobites dressed as surgeons - a scene that never appears in the film. In interviews, everyone always said that they posed for publicity stills like that, which is why the shot exists; but they never actually shot such a scene. Well, here it is! Arrow found it. It's in low, video tape quality and it has this ugly "Copyright: Troopstar" notice printed in large text over the entire scene; but after all these decades, we finally get to see that scene! Hell on Earth: The Story of Hellraiser III - This was an extra on the Leviathan DVDs; a 30+ minute documentary on the making of part 3.
an interview with David Gatward, a horror author, about Barker's books. Hellraiser: Evolutions - a documentary that runs a little under an horror on the legacy of the Hellraiser films. It's got a lot of stuff on the later films, and even interviews some of the people who worked on those, like Rick Bota and Scott Derrickson. Definitely one of the most compelling new extras, although I wish they got a little more specific about the sequels than generally pontificating about the legacy. I guess I was hoping for a Crystal Lake Memories of Hellraiser, but that would be insane to ask of a bonus disc extra. This is already pretty neat. The Hellraiser Chronicles: A Question of Faith - This is a Hellraiser fan film. It's fairly cheesy, but earnest. And of course the bonus disc also includes the interview footage that accompanied Salomé and The Forbidden on the Anchor Bay boxed set, because like I said, all the extras from there are on here. And I'll reiterate just to be clear, the original commentary and Hellraiser: Resurrection feature from the 2000 DVD are in the Scarlet Box as well. 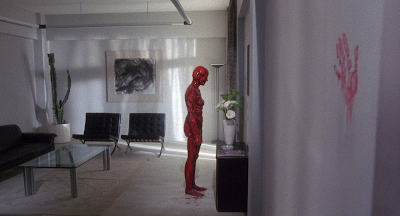 The only extras not in the Scarlet Box are those three Red Shirt interviews from the US blu-ray. If you want to be an ultra-completist, you'll have to get that, too. Andrew Robinson is interviewed in Leviathan, though, and Lawrence and Young are both interviewed in Hellraiser: Resurrection (Lawrence, of course, is on the Hellraiser commentary as well). So you do get them in this set, just not those particular interviews. For almost everybody, this box should be more than enough. The Hellraiser and Hellraiser 2 discs also have an easter egg apiece tucked away for those of us who remember the old VHS tapes. 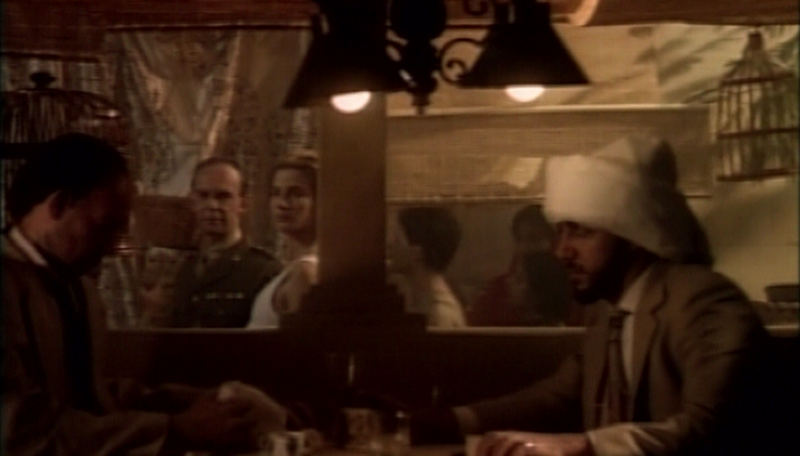 The first easter egg was also on the Anchor Bay boxed set - again showing that Arrow has imported absolutely everything. The second one is new. 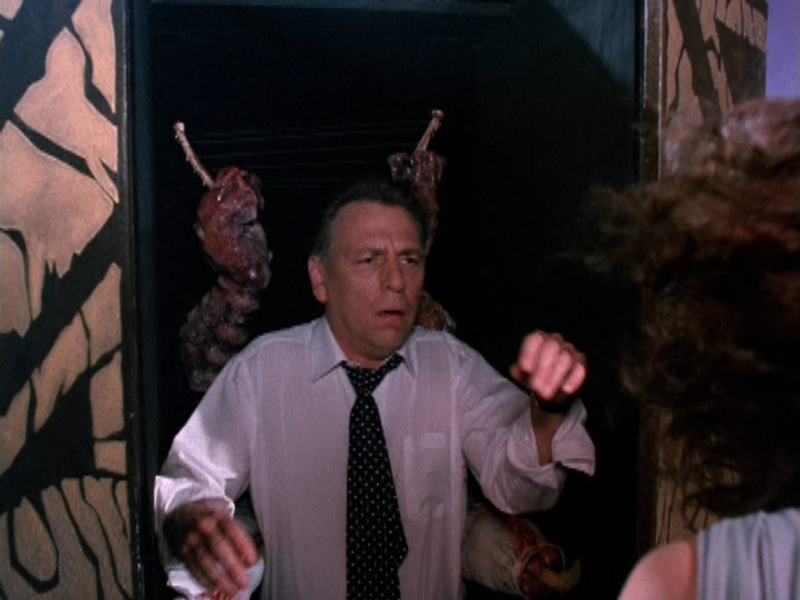 Oh, and the short clip of behind the scenes footage on the new Hellraiser 2 blu was also an easter egg on the Anchor Bay box. Oh god, and I still haven't talked about the packaging yet. Now, the Lament configuration box was pretty neat (if flimsy), and it had a booklet with notes from Barker himself as well as critics. And the old Hellraiser tin was neat and had some cool postcards in there. But man, this new box has everything. 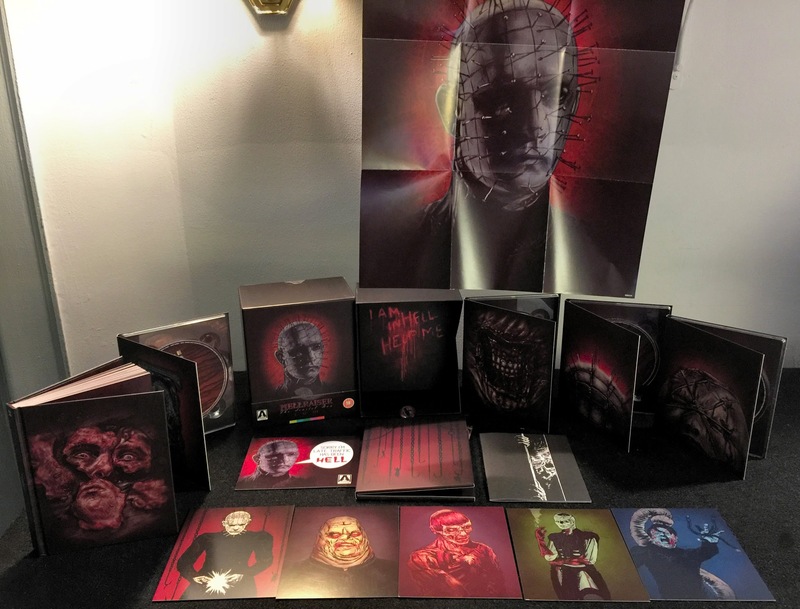 Look at the picture at the top - this box has multiple postcards, a little booklet of Barker's conceptual art and storyboards, a double-sided, fold-out poster, a Pinhead pin, and you want a booklet? This set has a 200 page, hardcover book in it! It's actually written by the two critics who wrote notes for the Anchor Bay box; but apparently they had a lot more to say. And it's all in a very nice, and absolutely not flimsy box. This is a massive collection that will take you ages to work your way through. 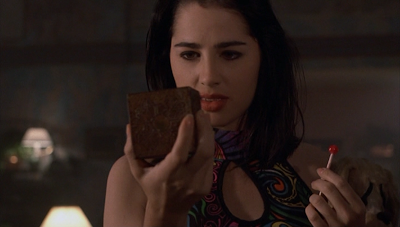 And if you're a serious Hellraiser fan, you'll love every second of it. Of course, it already sold out during the pre-order stage, so you're going to have to put in some extra effort if you want to snag it and haven't already got it on the way. I'm sure copies will pop up here and there, though. And of course Arrow will ultimately sell the three Hellraiser blu-rays individually, sans the bonus disc and the book and all. But if you're looking for the best way to go, this is unquestionably it. Best transfers, best extras, best packaging. Arrow played to win this time, and Hellraiser fans should be thrilled. Puzzled why you would compare the Anchor Bay DVD to the Arrow Blu Ray. How about Blu Ry to Blu Ray for fairness? I DID compare blu-ray to blu-ray. 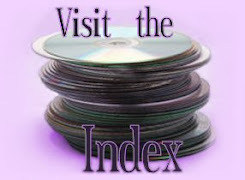 The US DVD, the UK DVD, the US blu and the UK blu are all included in this comparison. You didn't do that originally. You edited this review. I'm sorry; that's just not true. The US blu-ray was always a part of this review. I don't know what else to tell you... I actually had screenshots and the cover scan of the US blu-ray (and the DVDs) taken and ready to go on my PC for months in anticipation of this review, waiting for my Scarlet Box to arrive. Why did you use an AB grab with Chanards hand slightly moving (his finger), so the grab looks blurry? Not a fair comparison to the Arrow of the same scene as the AB appears to be moving when you froze it. Hey, good question! It's actually the exact same frame as from all the the other discs in that comparison, so completely fair. It just looks worse/ problematic because it is worse/ problematic. The movement looks messed up (blurry/ ghosty) on the Anchor Bay UK disc is because it's interlaced, which was something I wanted readers to be able to see/ know about. That particular disc really has that display problem when you view it on your/ any player.